A study on the physical unclonable function device based on nano-electro mechanical switch, developed by Hwang Gyu-man (Master's course) from Prof. Choi Yang-kyu's lab, was published in ACS Nano and at the same has been introduced in Science Daily, phys.org, EurekAlert. 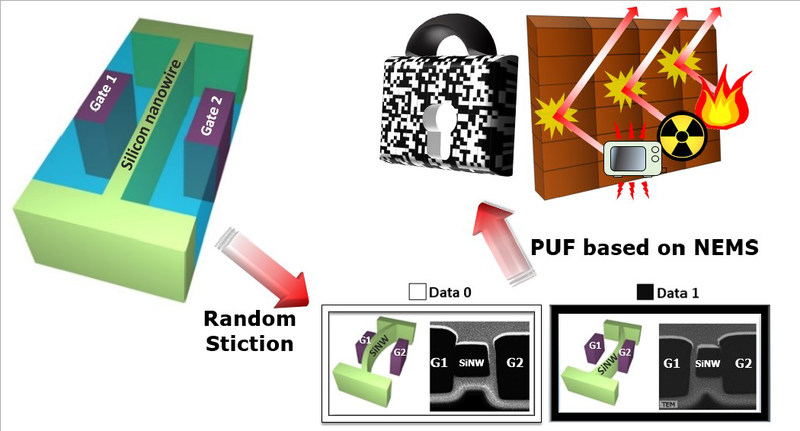 PUF (Physical Unclonable Function), a hardware (HW) -based security technology that solves the structural problems of software-based security solutions and is easily applicable to IoT devices, is attracting attention. However, the existing PUF has a disadvantage that its performance deteriorates due to its surrounding environment. To improve this, PUF which can operate in extreme environment while guaranteeing basic operation characteristics (randomness, uniqueness and repeatability) by using nano-electro mechanical switch was developed. It is expected to be used as a security module for the military or space industry, which is subject to extreme environmental conditions.